Have you ever wondered how you'd look like with a slimmer face, nicer nose, fuller lips, toned stomach, etc? Wonder no more! The Belo Medical Group just came up with a new Ipad/Iphone app that lets you enhance your features by a few strokes of your fingers. Get ready to be BELOFIED! I was delighted when I got invited to this very intimate BELO bloggers night. As in we were only 8-10 I think? I love intimate events:) BELO spoil their bloggers! It was held at KASBAH, The Fort Strip. The food was amazing and the ambiance was light and friendly. 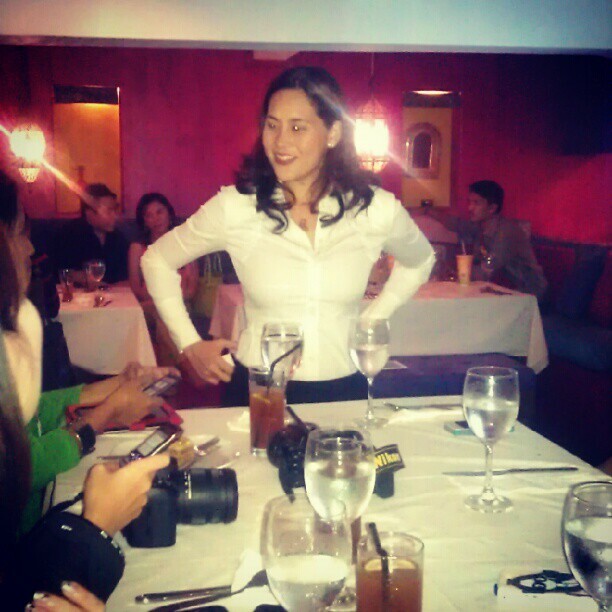 Post dinner, we were welcomed by the super gorgeous Cristalle Belo! As in we were just staring at her. She then introduced the brain behind the successful app, Mr. Al Galang! even Kris Aquino is addicted! you can view all the history of Belo and the services they offer! Dra. Vicky Belo also revealed the procedures done by THE Fashion Pulis himself Mr. Michael Sy Lim and Cristalle. In fairness gandaaaa! You can use this app anytime so you'd see how you would look after a procedure BEFORE it's actually done. Of course the night won't be complete without a mini game! We were divided into 2 groups and were given Ipads with the same photo in it to enhance...Best result wins! Upon it's launch, in under 1 month, the BELOFIED app instantly became a hit and climbed the top spot on the Philippines Medical Apps and 17th worldwide! Wow! They also introduced their newest Belo Essentials product, Anti Perspirant Deodorant! I'm now using this and I'm loving it! Here's the answer to your underarm problem ladies! Their Underarm Whitening Cream! Follow BELO on Facebook and Twitter! Ang hightech! :D Feel ko masstarstruck ako sa Belos hehehe :) I wonder if I'll ever think of undergoing a procedure, scary but interesting! Indeed a lovely night! See you around!